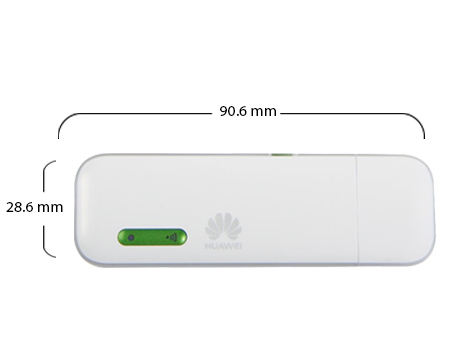 The Huawei E355 Mobile WiFi Smart 3G dongle was made for the frequent travelers who need to be connected to the Internet at a moments notice, no matter where they are. This little 3G dongle has a smart and compact design that makes it easy for you to carry it around in your pocket or your purse. This dongle has dimensions of 90.6 x 28.6 x 12.6mm and weight of merely 40g, which makes it ultra portable. The Huawei E355 is compatible with a number of operating systems, so you don’t have to worry about it not working with your system. The compatible operating systems include Windows XP, Vista, 7, 8, Mac OS X 10.5, 10.6, 10.7, and 10.8. The Huawei E355 3G dongle uses the G Plus technology to give you seamless wireless WiFi access from wherever you are and wherever you go. This makes sure that you stay connected to the network and get fast speeds at all times. Your 3G dongle lets you share your wireless Internet connection with a maximum of 5 people. They can use the WiFi from their respective devices, be it a tablet, laptop, smartphone, etc. Now everyone can have fun. You can now charge your Huawei E355 3G dongle whilst creating a WiFi hotspot for everyone to enjoy. This ensures there are no stops to your fun. Enjoy fast speeds even on the move with your little 3G dongle. This dongle gives your wireless connection with a range of up to 21m.